LA Americana singer-songwriter Ryan Bingham and New Jersey heartland punk turned folk solo artist Brian Fallon, who took very different paths to arrive at a very similar place in their respective careers, are currently in the midst of a co-headlining tour, which makes a highly-anticipated and well-suited stop this weekend at The Ryman Auditorium on Sunday, Oct. 2. With support from Paul Cauthen, also preparing to mount a new solo career, the mix of country, rock, folk, and roots music should be enough to appeal to any fan of quality, heartfelt music, and primed for the Mother Church. You can still grab tickets here, so secure your seats and read on for details. Raised in the southwest and now based in Los Angeles, Americana singer-songwriter Ryan Bingham has, at 35, accomplished more than many musicians could hope to in a lifetime. He’s won an Oscar, Grammy, Golden Globe, and Americana Award, all for 2010 single “The Weary Kind,” which appeared on the soundtrack for Crazy Heart, has released five full-length albums in less than 10 years, has collaborated with T. Bone Burnett, has opened for Bob Dylan, has gone from a major label to owning his own successful imprint, and has landed in the country, rock, and overall Billboard charts simultaneously on multiple occasions. Born in New Mexico and raised in West Texas, Ryan began writing songs in his teens, eventually cutting his teeth in bars and dives, and forming a backing band, The Dead Horses, who would stay with him until last year’s Fear and Saturday Night, for which he unplugged, formed a new band, and spent time in an airstream in the California mountains to help find inspiration. Fusing elements of Americana, rock, and roots music, Bingham’s music has been universally hailed as some the best of his generation, and with as fast and celebrated as his career has managed to move so far, he seems destined to become a modern legend. A honed and captivating performer, able to channel raw and resonant emotional weight, Ryan Bingham serves as a traditionalist counterpart to fellow performer Brian Fallon’s more punk-derived sensibilities, and their marriage of styles will make for an epic evening. For a decade, singer, songwriter, and New Jersey native Brian Fallon has best been known for fronting seminal heartland punk group The Gaslight Anthem, who announced last year that they would be going on a hiatus. While Fallon has flirted with side projects before, most prominently The Horrible Crowes and Molly and the Zombies, he decided this year to focus his newfound free-time on releasing his first major solo effort. Recorded right here in Nashville and produced by Butch Walker, the album is called Painkillers, and dropped back in March through Island Records to strong reviews. Earnest, raw, eclectic and folky, Fallon’s solo sound still maintains the punk backbone he’ll likely never shake, and should serve both to satisfy Gaslight fans and also win over those more attracted to his newfound Americana flair. Though Brian hasn’t really been playing Gaslight material, he does seem to consider The Horrible Crowes fair game (he’s even calling his backing band “The Crowes” nowadays), also occasionally digging into his Molly and the Zombies repertoire for solo shows. With his punk background, flair for folk and alternative, and unparalleled ability to craft raw and honest songs, Brian Fallon is nothing short of an extraordinary live performer, and whether he’s loud and raw or quiet and introspective, he’s always a marvel to watch. Sons of Fathers co-founder Paul Cauthen is gearing up to release his debut solo album, My Gospel, Oct. 14 via Lightning Rod Records, and with a renewed focus and a refined style, the Texas native, a perfect choice to compliment Bingham and Fallon, has never sounded better. Entrenched in gospel from a young age, Cauthen was pushed towards music by his songwriter grandfather, who’d notably worked with acts like Buddy Holly and Sonny Curtis, going on to start Sons of Fathers after a few years of raising hell, getting kicked out of college, and spending a stint in jail. Returning home to Tyler, Texas after the dissolution of his band, Paul spent the last several years crafting his debut, tapping into an eclectic variety of musical influences and rediscovering his nuanced artistry, pulling from country, folk, gospel, and folk. About to embark on a clear second chapter, it’s an especially exciting time to see Cauthen in person! 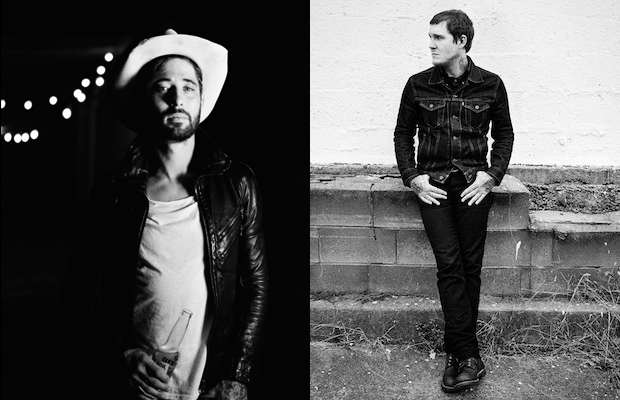 Ryan Bingham, Brian Fallon, and Paul Cauthen will perform Sunday, Oct. 2 at The Ryman Auditorium. The show is all ages, begins at 7:30 p.m. (doors at 6:30 p.m.), and tickets are available to purchase for $26.50-36.50.